How do you get your hands on adidas’s fantastic Adibow24 shape hockey stick without bending your bank balance out of shape? The answer is the adidas LX24 Compo 3 and it’s review is why this is one of the best selling adidas hockey sticks on the market. We have been fortunate enough to review a number of hockey sticks from the LX24 range and the Compo 3 really earns it’s place as one of the best mid-priced hockey sticks. Initially I was a little concerned with the lower composition of carbon fibre in the adidas LX24 Compo 3 hockey stick, it is a composite mix of 30% carbon fibre, 65% fibre glass and the most important component that elevates this stick is adidas use of aramid. Aramid is the material used in bullet proof vests, this is applied in the LX24 Compo 3 hockey stick in the important impact areas, the face of the stick and the reverse side edge. The 3 materials come together well to make a good hockey stick. Featuring the Adibow24 shape shaft which is low enough at 250mm to make 3D work effective and high enough to be comfortable when dribbling the ball, the adidas LX24 Compo 3 is great for making your way quickly around defenders. The LX24 Compo 3 hockey stick has enough give in it to give you a feeling of control when caught in tricky situations and also a good amount of power considering the composition so you can deliver shots and passes powerfully at the end of your run. With a price tag around the £100 mark you might compare the LX24 Compo 3 to other hockey sticks thinking that the material composition is quite low. In all honestly I really couldn’t have told the difference if the spec had turned out to be 65% carbon and 30% fibreglass. adidas do something to these mid-range sticks that makes them really good quality. This review of the adidas LX24 Compo 3 wouldn’t be complete without talking about the design on these 2015/16 models of the LX24 adidas hockey sticks. The green is awesome and the black is much more matte than it appears in the pictures. 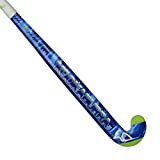 As well as having a really great hockey stick that functions fantastically for dribbling and clever 3D stuff, with the LX24 Compo 3 you will look really cool out on the pitch. A good quality, well rounded shape, durable hockey stick. 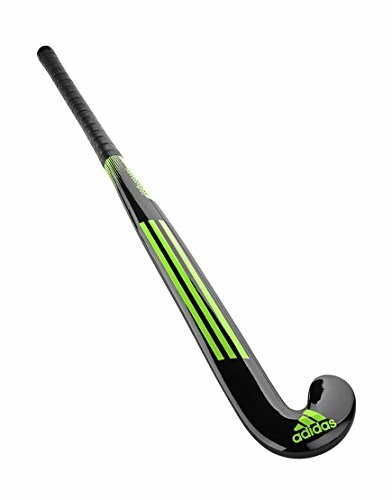 If you review hockey sticks around the £100 mark, the adidas LX24 Compo 3 should definitely go in the mix. Or head over to our hockey stick reviews homepage and see what else is out there.